The way you can find out on Facebook or Twitter, how many times have been shared or retweeted. In the same way, there is a new feature in WhatsApp which will tell how often you have forwarded the message. Apart from this, Whatsapp is working on another feature which will continuously detect messages being forwarded to the message. Through this feature if you have forwarded a message more than 4 times, it will be able to track it. In this article, we will tell you the Whatsapp’s new feature whatsapp forward message feature. This feature has been spotted on WABetaInfo, the blog providing information related to Whatsapp developers. According to the information posted by a developer on WABetaInfo, two features will be added for Android users in Whatsapp soon. How many messages have been forwarded through these features will be tracked. Apart from this, users who repeatedly forward messages will also be monitored. This step of Whatsapp has been taken to prevent the spread of the fake news. Fake news or message forward on Whatsapp last year caused many violent incidents in India. Since many people were killed, the government had instructed Whatsapp to reinforce such a fake news. Since then, Whatsapp has been working on many features including group admin, reverse photo. Talk about this new feature, then this feature will be available in Whatsapp’s info section. In this, users will be able to see whether their message has been forwarded or not. This feature will also be able to know how often the message has been forwarded. 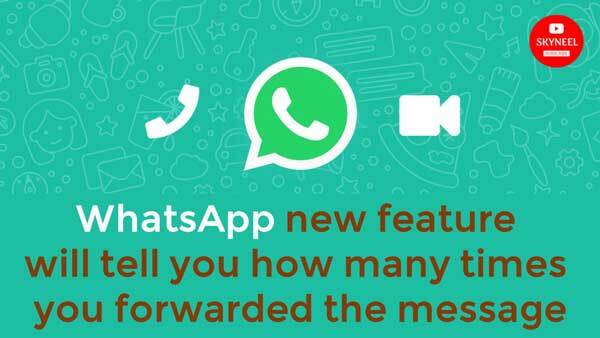 Through this feature, every forwarded message will be labeled on the Whatsapp. You will be able to see it above the message text. Just like you can see about any forward message. If a message is forwarded more than four times, then users will see the Frequently Forwarded label. It will be able to know which message is being viral or spreading. However, the testing of these features is currently underway. Beta users can find these features in the next update, while Stable or Man Whatsapp users will not get any information about when this feature is available. But, the addition of these features will keep track of viral messages. In this article we have told you about whatsapp forward message feature. If you liked this article, you can also like our Facebook page and also subscribe to our YouTube channel. If you have any problems related to this article, you can tell us by commenting.